The difference that the Ninth was talking about… you should know, right? Well, if you don’t… the difference is that Tsuna has friends while Enma doesn’t. He has the Shimon family but they are only connected through a common goal, revival of Shimon family. They have no friendship bonds between any of them. Their relationship to one another is that of boss and subordinates or fellow guardians. 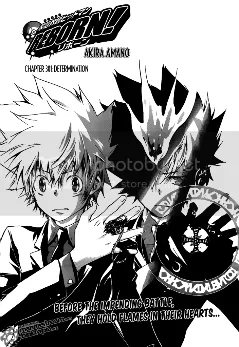 As for the Vongola family, their relationship is that of buddies/friends which is what should have Tsuna prevail. Tsuna seems to be getting stronger but will he be able to stand a chance against the Shimon family? It won’t be a fair fight since the time of their attack is before the Shimon family is fully awakened. Will Tsuna try to fight the Enma fair and square by waiting for the seventh day where the Shimon family will completely awaken their power? Omg, >.< Spanner of the current time looks so… ADORABLE. :3 ahah. He’s just a little boy but he is able to create advance models of the x burner headphones and contact lenses. He deserves to be praised. This entry was posted in Katekyo Hitman Reborn, Manga, Reading Right Now and tagged action, Shimon Family, Vongola Family. Bookmark the permalink.